Of all the many, many things I love about Paris (my name is Jude and I have been a Francophile since I was four years old and succumbed to the charms of Pepe Le Pew), the French cuisine certainly ranks at the top. As soon as I’m off the plane at Charles de Gaulle, my mouth begins to salivate with the thought of escargots swimming in garlic butter, rich foie gras spread on toast points, a bowl of moules sitting companionably beside a cone of pommes frites. Not to mention the cheeses, the wines, the pastries! I’ve had some stellar meals in Paris over the years in some pretty spectacular settings, but by far the best was the New Year’s Eve dinner Ken and I shared at our tiny Left Bank hotel. And when I say at our hotel, I don’t mean in the restaurant, but in our room. And when I say in our room, I don’t mean room service. We were in Paris on New Year’s Eve to celebrate not only the new year, but our 10th anniversary. We had tickets for a jazz club, but had made no dinner reservations since we figured that, like back home in New York, dinner at a nice restaurant on New Year’s Eve was less nice than on another night, not to mention much more expensive. 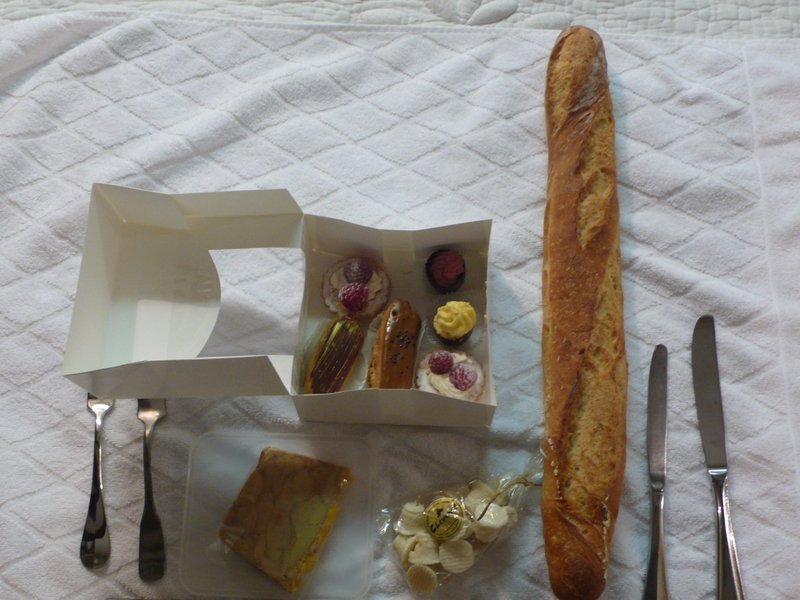 Instead we decided to make a little French picnic on our hotel bed. So I made a foray out into the streets of the 6th arrondissement where we were staying, hitting up the boulangerie for a baguette, the fromagerie for fresh buttons of chevre and a chunk of brie, the epicerie for an intriguing egg-aspic-smoked salmon concoction and foie gras and bottles of Badoit, the patisserie for heavenly mini eclairs filled with vanille, chocolat and cafe. Last stop, the wine shop for a split of champagne. The delight in shopping like this–as if I were a Parisian! Back at the hotel, Ken and I spread all the food out on the bedspread and sat cross-legged with our feast between us. No fancy restaurant meal could have made us happier. We were already having the best New Year’s Eve of our lives. Yes yes yes! Ed and I did a picnic in the room on the bed this past November in Paris. 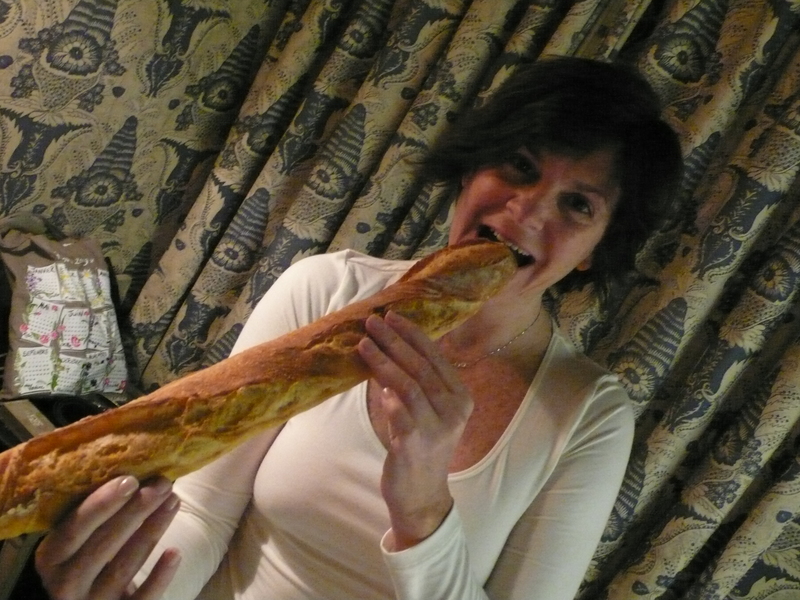 Half the fun was the shopping for all of our favorites in the Marais – we found the most amazing baguette – so dark and crusty – amazing pate, cheese, saucisson – not much that’s better than that! And it was cold enough to put things on the window sill for the next day – our own little fridge! Also love the French yogurt. A fruit tart. Mmmm getting hungry for Paris!